The photo of actor Kim Joo Hyuk which is full of humanity beauty became a hot topic. 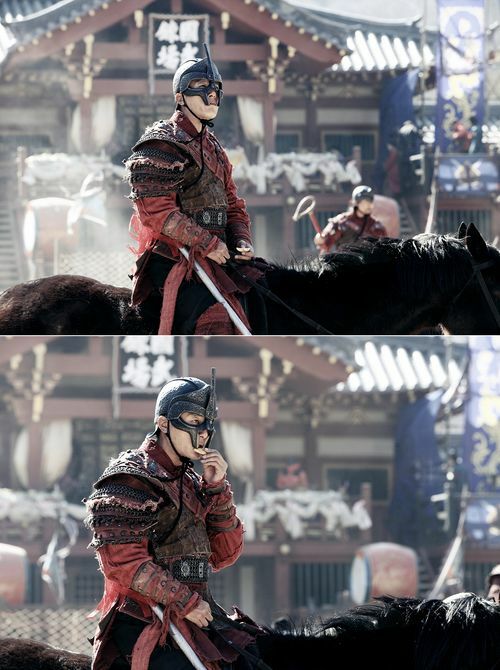 In early March 2012, among the behind the scene photos from the filming set of MBC weekend drama God of War, there was a photo which showed the look of Kim Joo Hyun when eating snack when he wore a helmet and rode on a horse to hit the ball. As he was wearing helmet, only eyes and mouth were exposed. But as the gap on the helmet for the mouth is small, Kim Joo Hyun was having a hard time to eat the snack, looked very pity. In the photo, he barely opened his mouth and ate the snack bit by bit, provoking laughter. Netizens commented on the photo, “Personally felt the frustration of slaves,” “Come on, eat,” “The process of eating snack is as tension as the ball hitting competition” and so on, the responses were overwhelming response. Kim Joo Hyuk is playing the role of Kim Joon in God of War who became a Joseon warrior from slave.